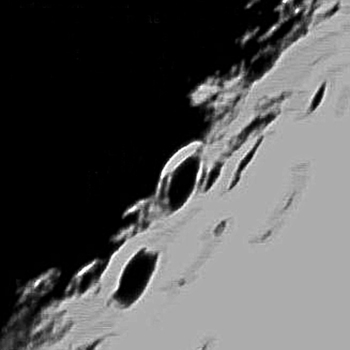 Hi, I have been keen amateur astronomer for decades, and have previously served on the committee of this Society as both Director and Assistant Director of Observations for many years. 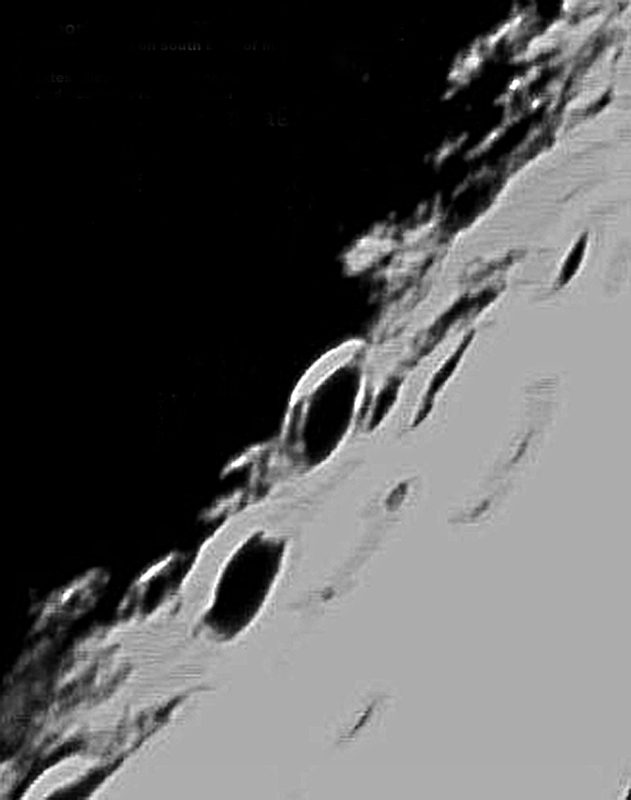 Although not on the committee now, I still get pleasure from helping the Society and its members with whatever astronomical skills I have developed over the years. 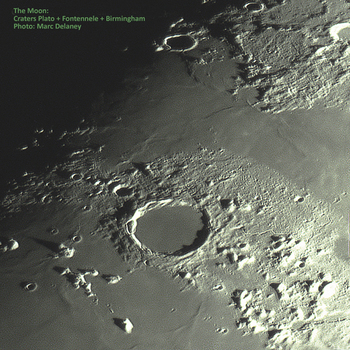 Here are some of the astronomical images I have taken with various telescopes and cameras. The deep sky images were shot with a DSLR or long exposure astro camera, taking several shots, then stacking. 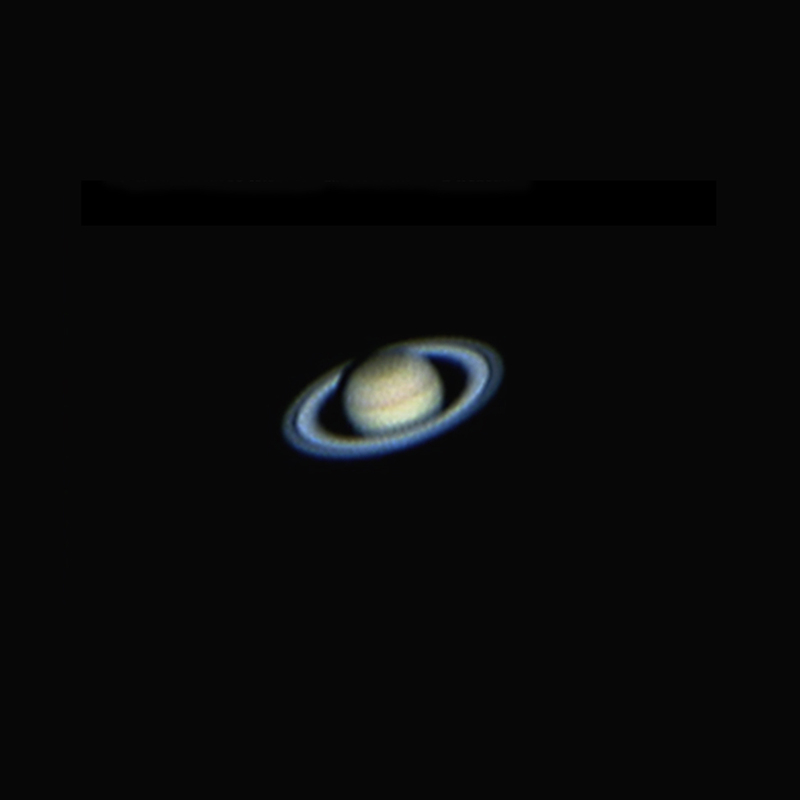 The Moon and planets required a video-type camera which captures hundreds of very short exposures in an AVI file, which are then stacked. 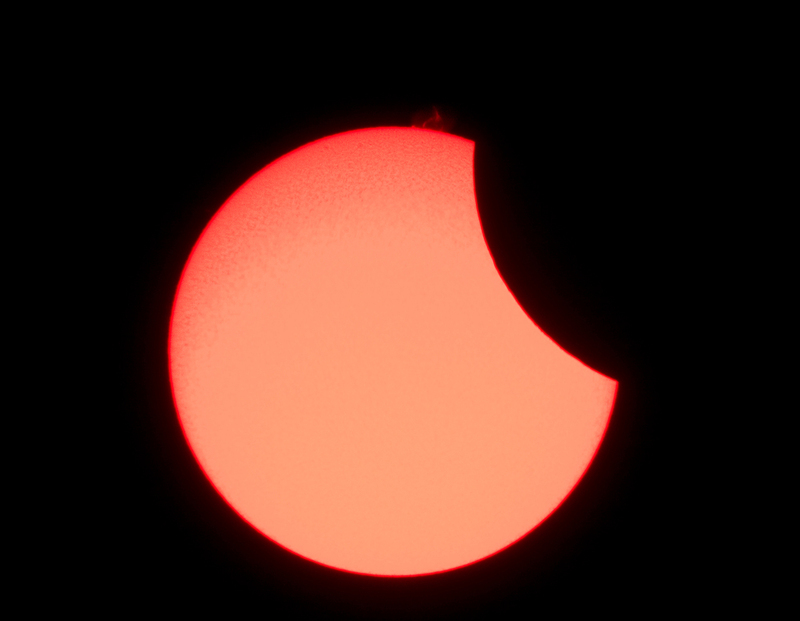 For the Sun any camera can be used, but it is absolutely essential to fit an approved solar filter to the front of the scope or use a dedicated Hydrogen-Alpha telescope - otherwise severe eye damage is guaranteed. 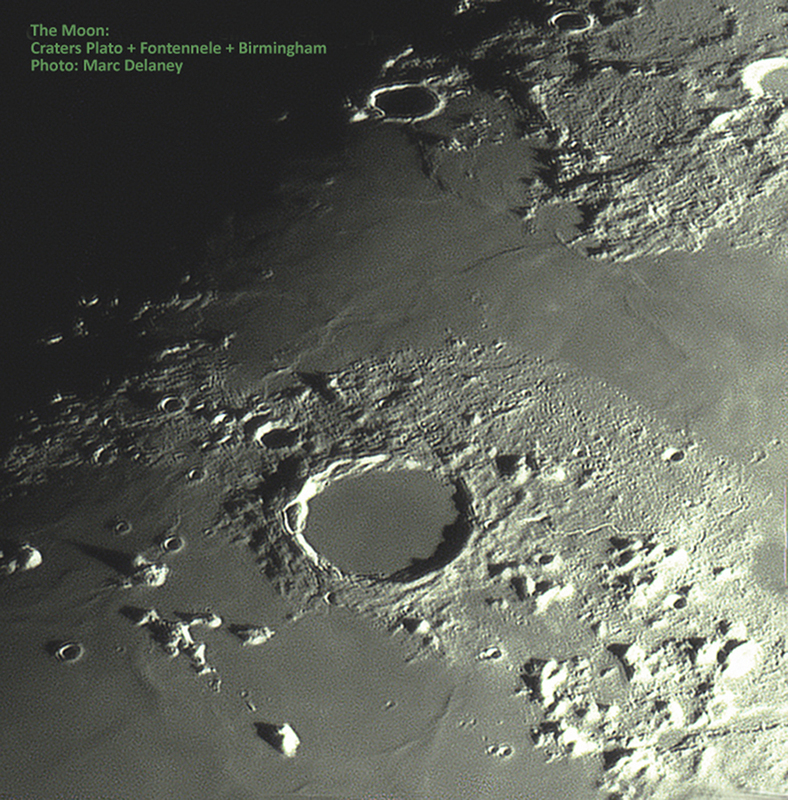 If you want to pick my brains on anything astronomy related, please contact one of the committee members to get in touch. 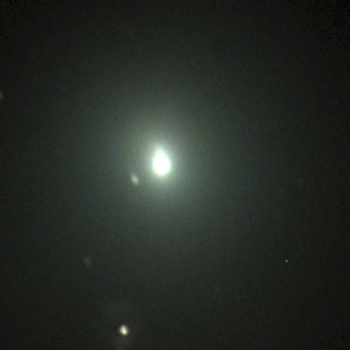 Comet Macholtz. 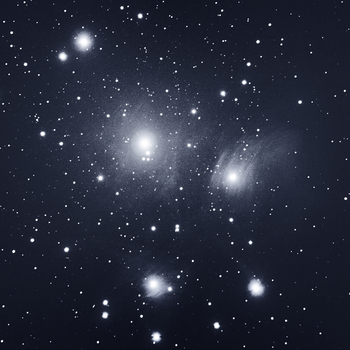 Comets are called "Dirty Snowballs" with good reason: they are composed of ice, rock and dust. Comets originate in the Oort Cloud, the outer region of our Solar system, and travel in very elongated orbits. They may recur, like the famous Halley's comet, or be one-offs. Coments are believed to have delivered water and building blocks of life to Earth and other planets. 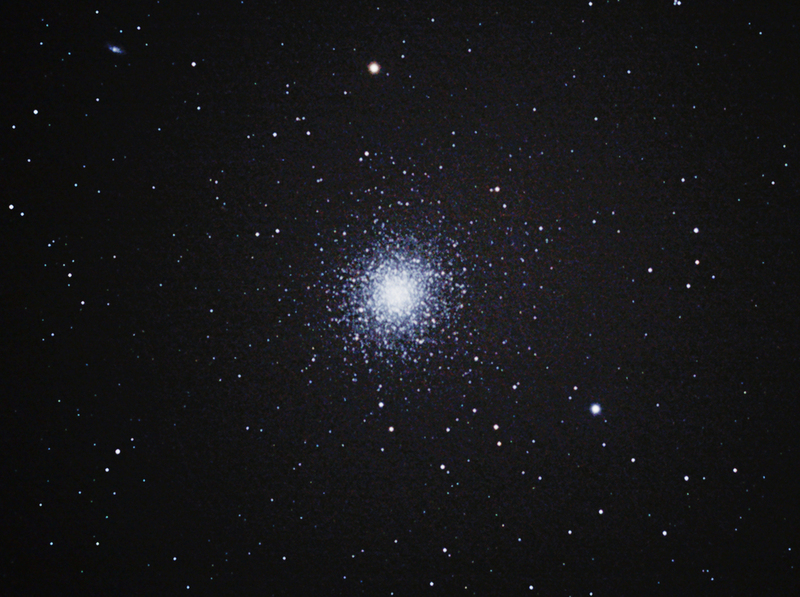 M13 Hurcules Globular Cluster. 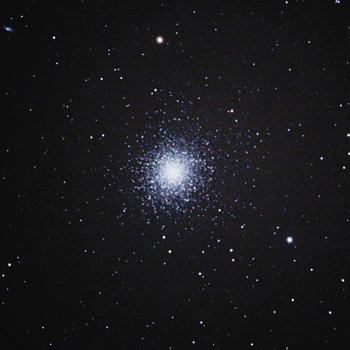 These clusters look like a tight ball of stars because they are just that: miriads of stars packed together in an apparently globular formation from here, but in reality, though tightly packed, there is a fair separation between the stars. 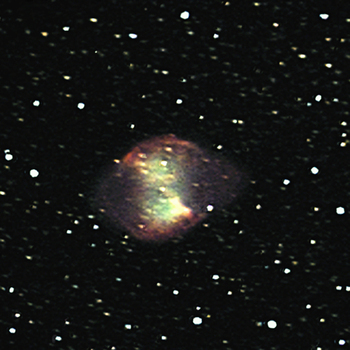 M27 Dum Bell Nebula - remains of an exploded star. When massive stars collapse in a nova or supernova explosion, their cores shrink to small but extremely massive neutron stars or white dwarfs, and the outer layers are blown away, ever to expand into space. This is what you are seeing in this image. 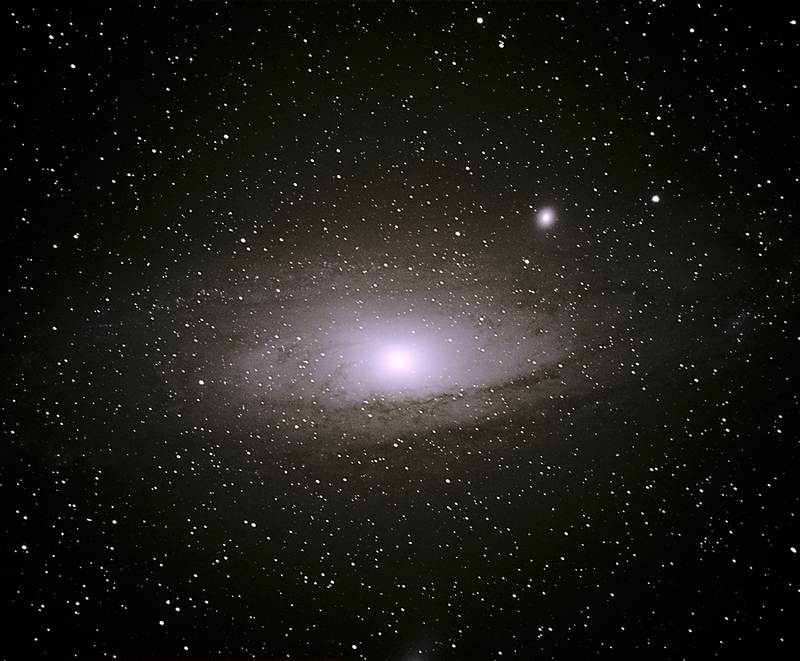 M31 Andromeda Galaxy -- the nearest major galaxy to our own Milky Way and a time and half as large. 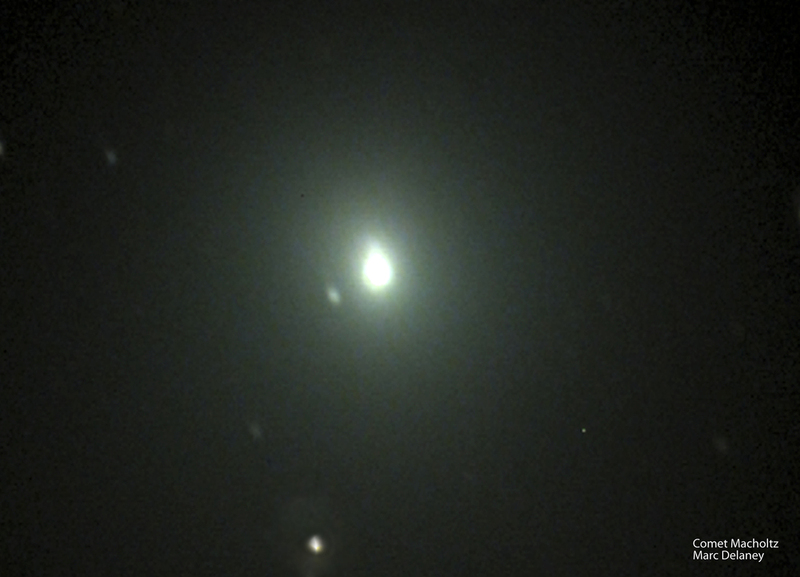 At two and a half million light years distant it is not that far in astronomical measurements. 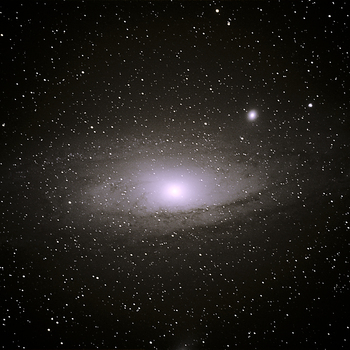 Andromeda and the Milky Way are closing in on one another and In the far distant future the two will merge, but we won't be here to witness that event! 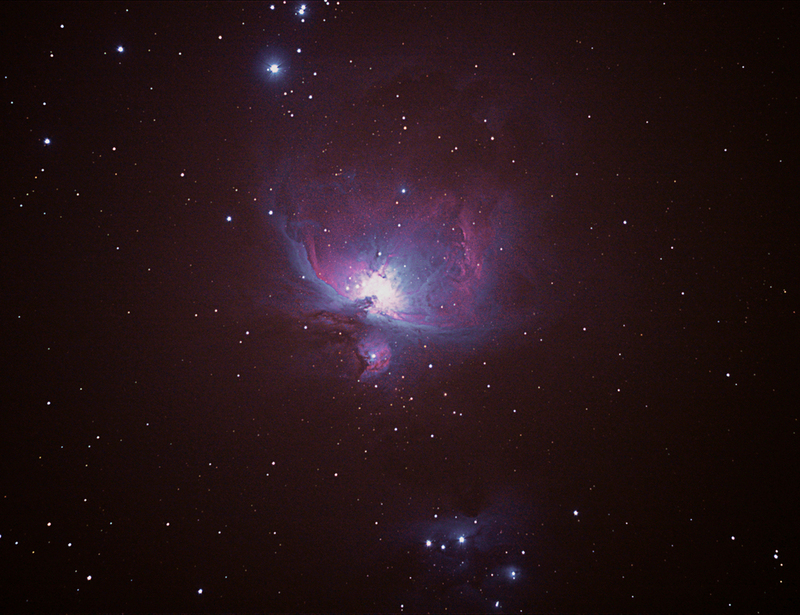 M42 the Great Orion Nebula. 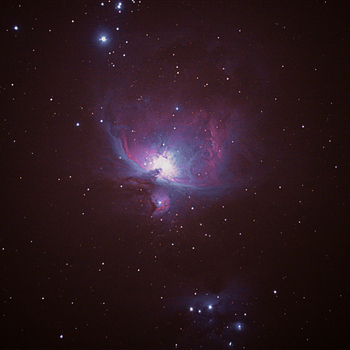 This a a vast star forming region of cosmic dust and gases, the most famous such nebula in the northern hemisphere and relatively easy to observe because of its nearness and brightness. 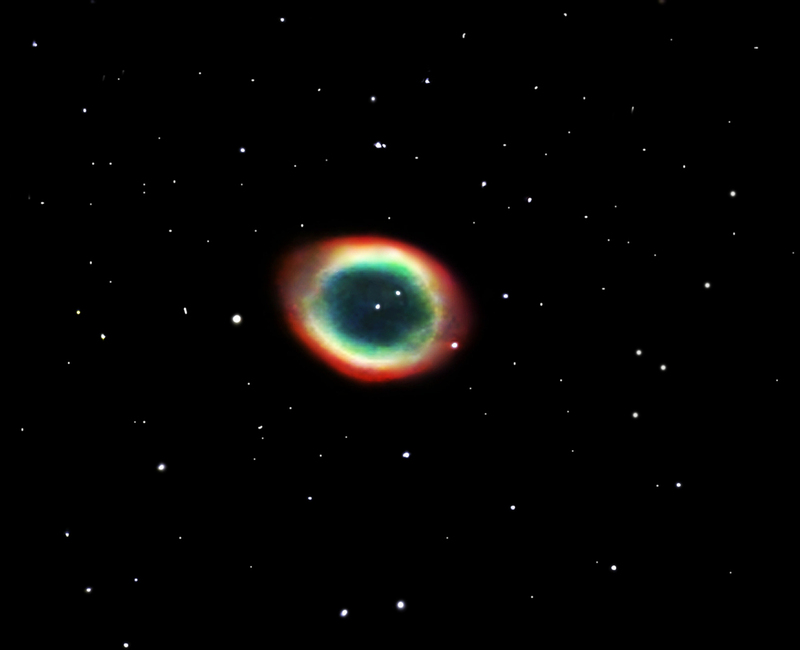 It is about 1500 light years away from Earth. 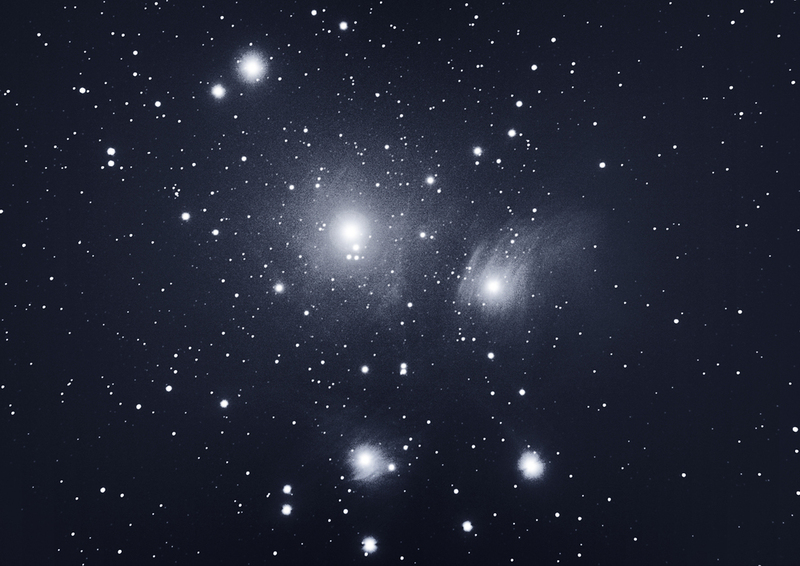 M45 Pleiades - a spectacular Open Star Cluster. 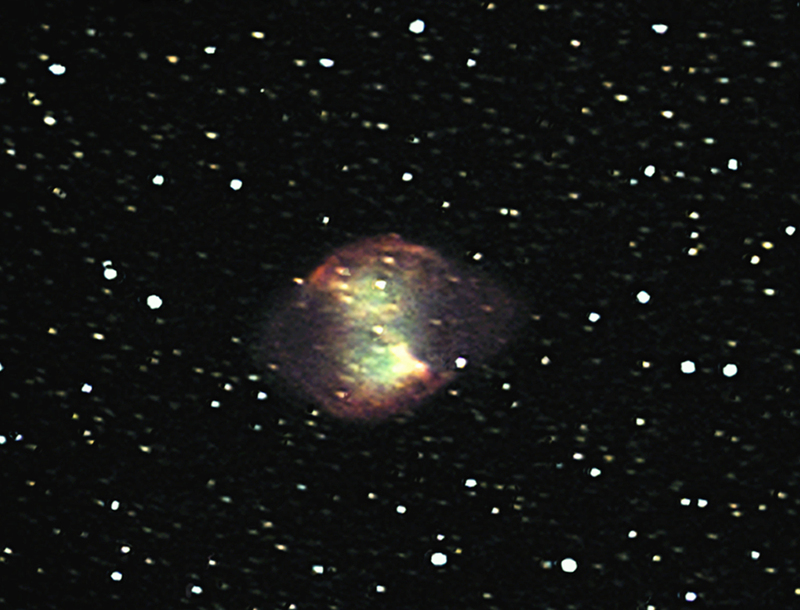 Some of the stars show nebulosity around them, because this is a young cluster only a few million years since formation and therefore remenents of the gas cloud from which the stars condensed are still lingering. 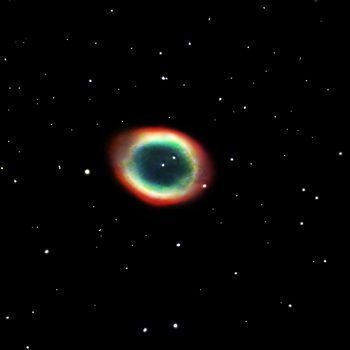 M57 Ring Nebula -- Like the Dumbell nebula, this too is the remains of a collapsed star, which eons ago was someone else's Sun! 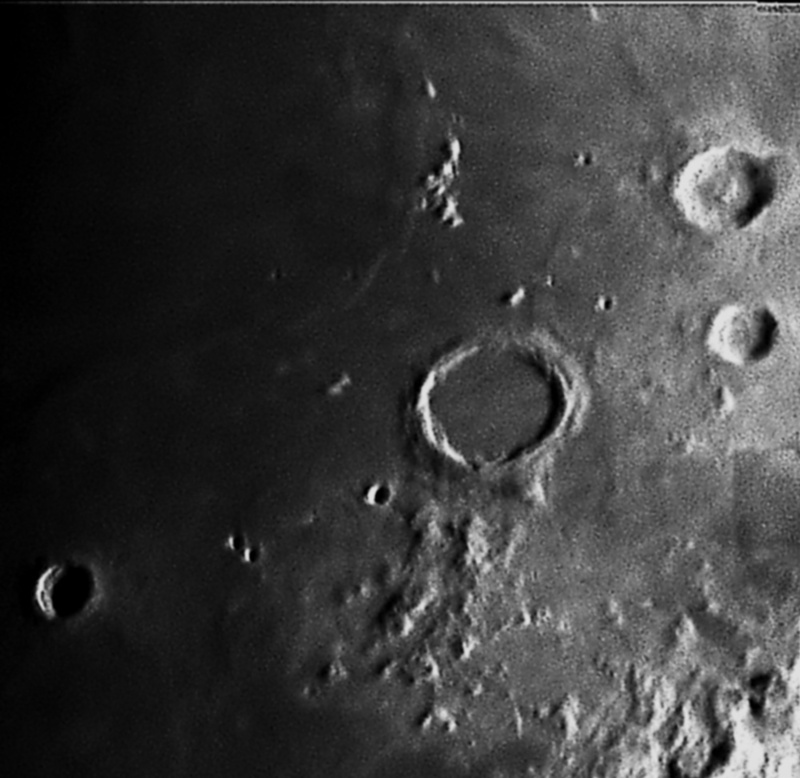 Moon - Crater Plato, an interesting circular formation on the edge of the Montes Alpes mountain range, likely caused by impact during the early days of the Moon., The other two craters are Fontenelle and Birmingham. 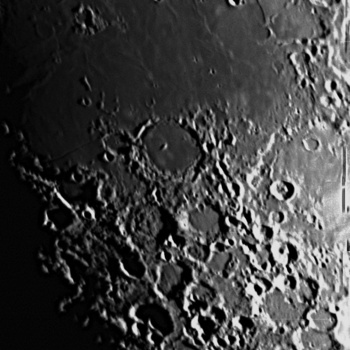 At the bottom right of the image is Vallis Alpes, a valley. 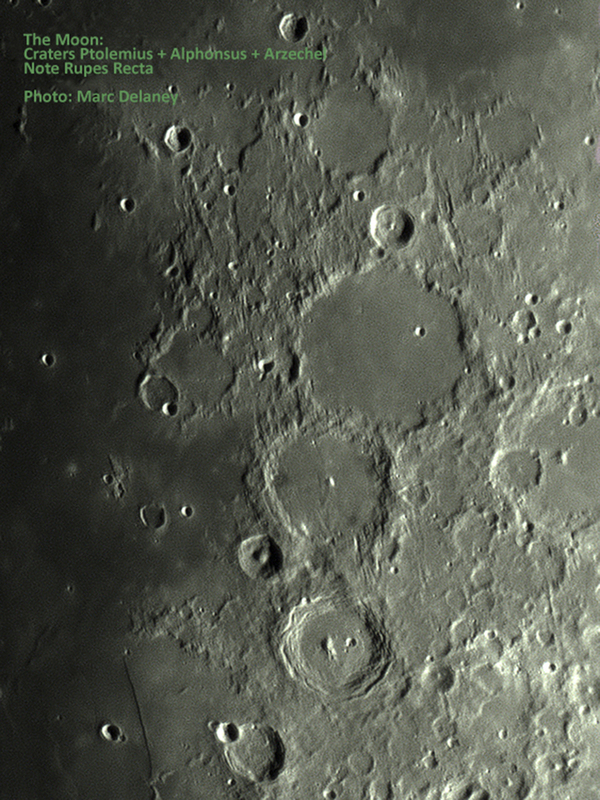 Moon - Craters Ptolemeus, Alphonsus and Arzachel -- an interesting trio of circular formations.To their right is another circular formation, Albategnius (western half), with inset crater Klein. 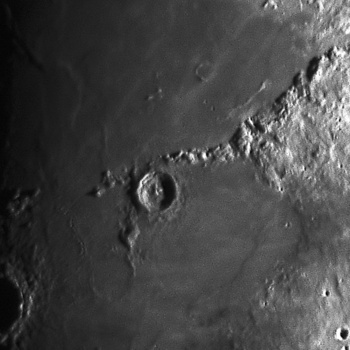 At the bottom left is Rupes Recta, which is a fault line similar to a rift valley on Earth.. Moon - Mare Crisium, a small "sea" which on the moon, like all other features, has no liquid water. 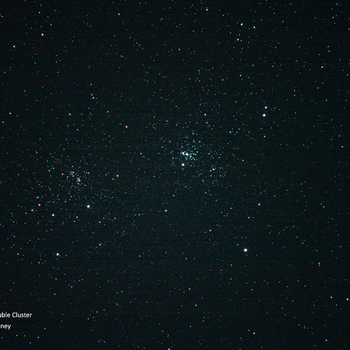 NGC 884 Double Cluster. 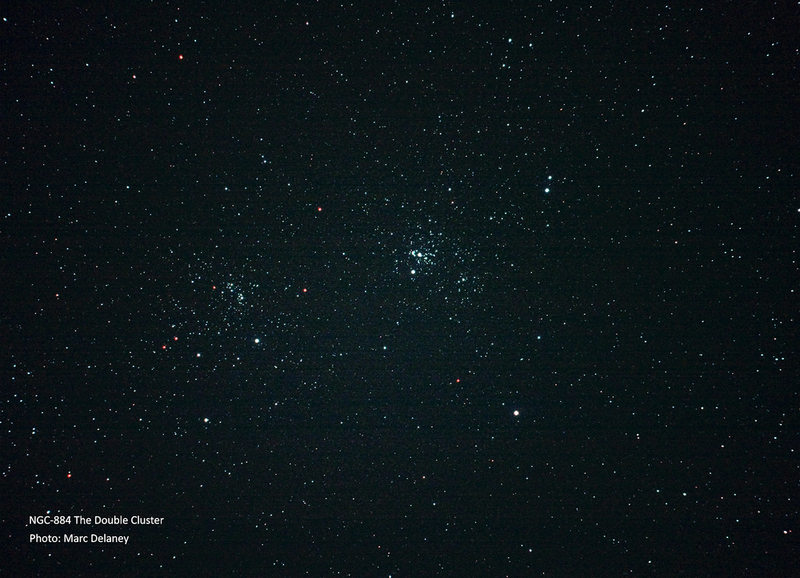 This is a twin open star cluster, but only optically so from our vantage point. They are not related in any other way. 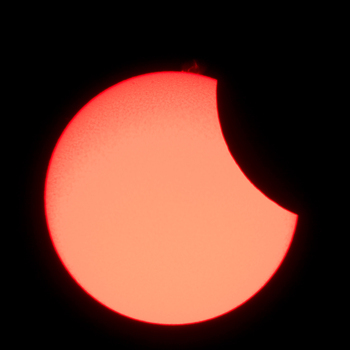 The Sun -- Partial Eclipse of 1st August 2008. 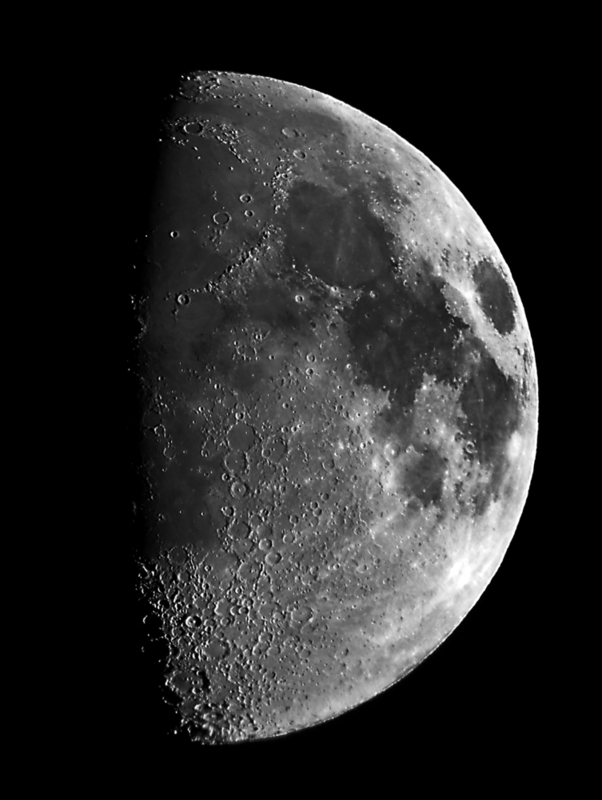 I photographed this with a Hydrogen-Alpha telescope and Canon DSLR from my back garden. 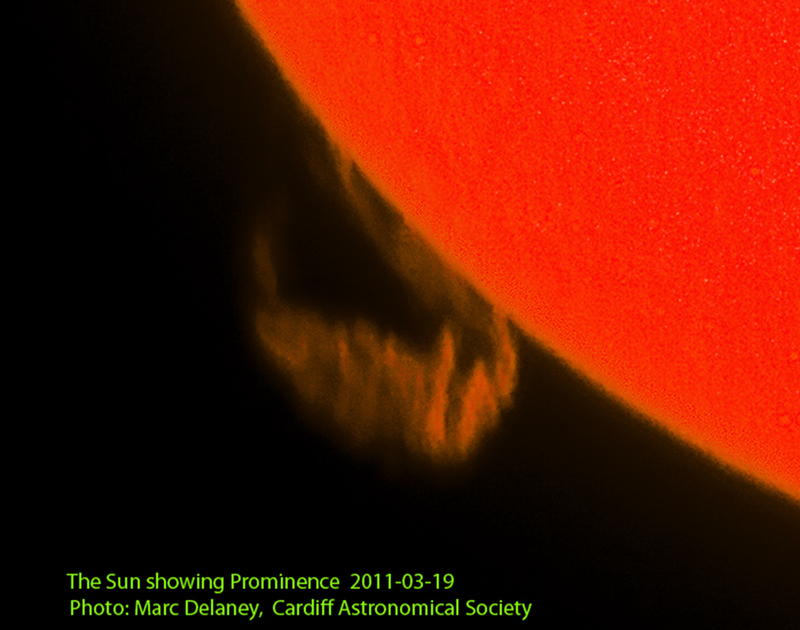 Note the prominence being ejected at the top. 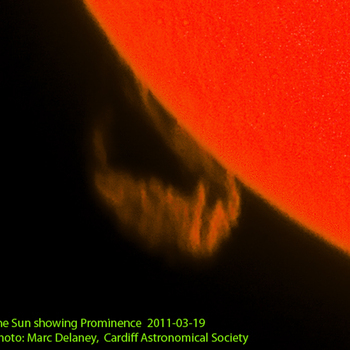 The Sun, showing a large Prominence. These are gas ejections from the surface of the Sun. 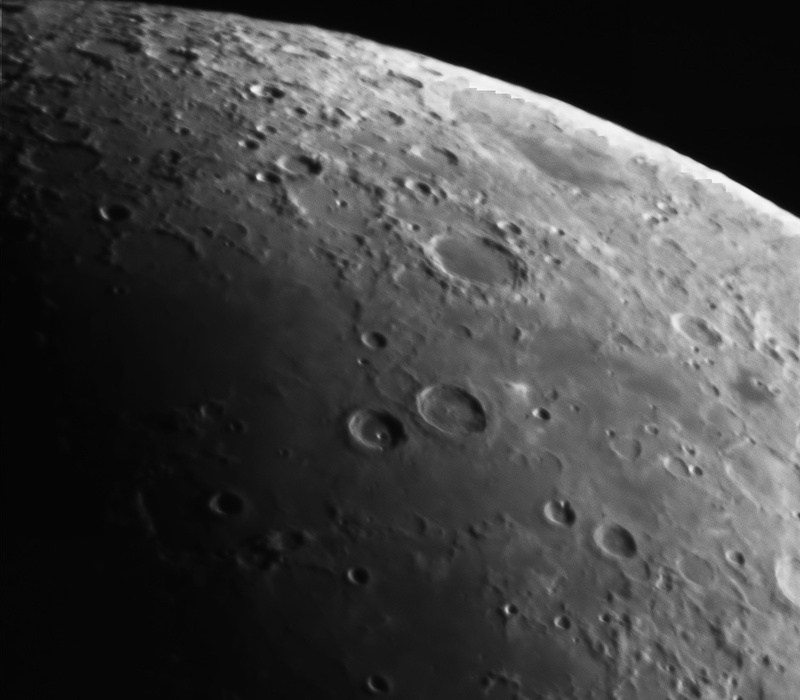 I imaged this using a Hydrogen-Alpha telescope which isolated the narrow H-Alpha wave length of light, hence allowing to image the chromosphere. 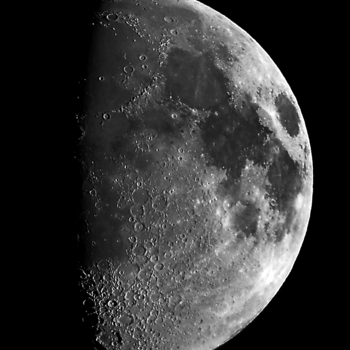 In ordinary white light only the Photosphere, that layer of the Sun which is considered "the Sun" in common talk, can be seen. 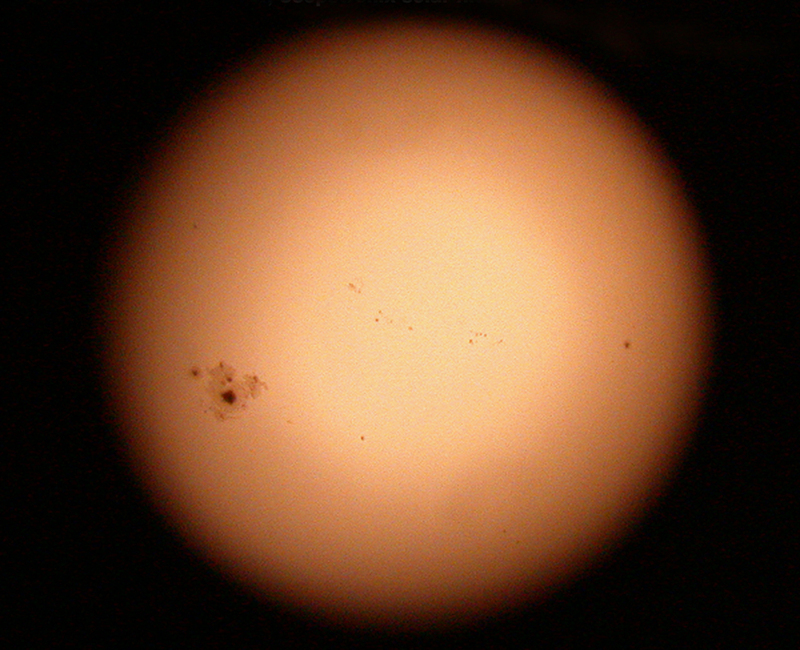 The Sun, showing a large sunspot group. 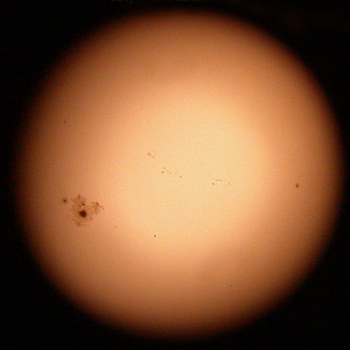 Sunspots are passing phenomenon that come and go and are generated by the Sun's magnetic field. 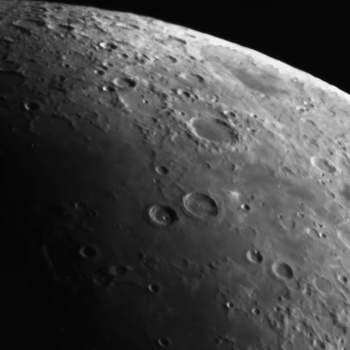 They appear dark because they are cooler than the surrounding surface of the Sun, but still hot enough to fry anyone venturing close in a second! 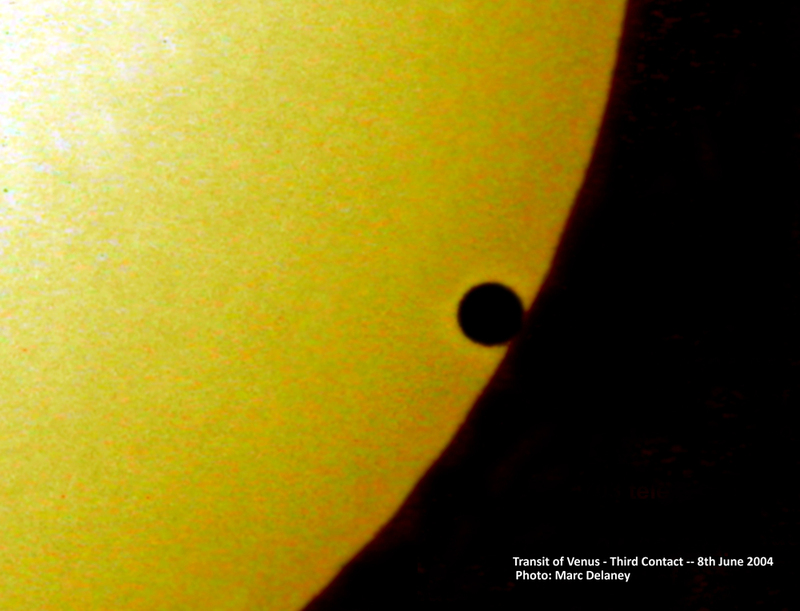 Transit of Venus, 8th June 2004. Transits occur when an inner planet, Mercury or Venus, is so positioned that we can see it in silhoutte transiting across the Sun. 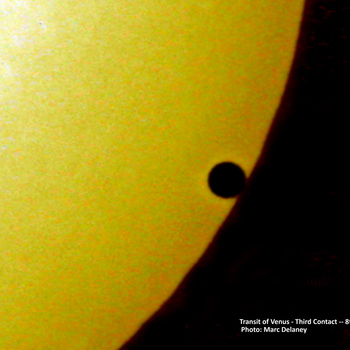 Two transits of Venus, 8 years apart, occur only once every 112 years. No one can experience this event more than once in a lifetime, and most will never experience it at all. 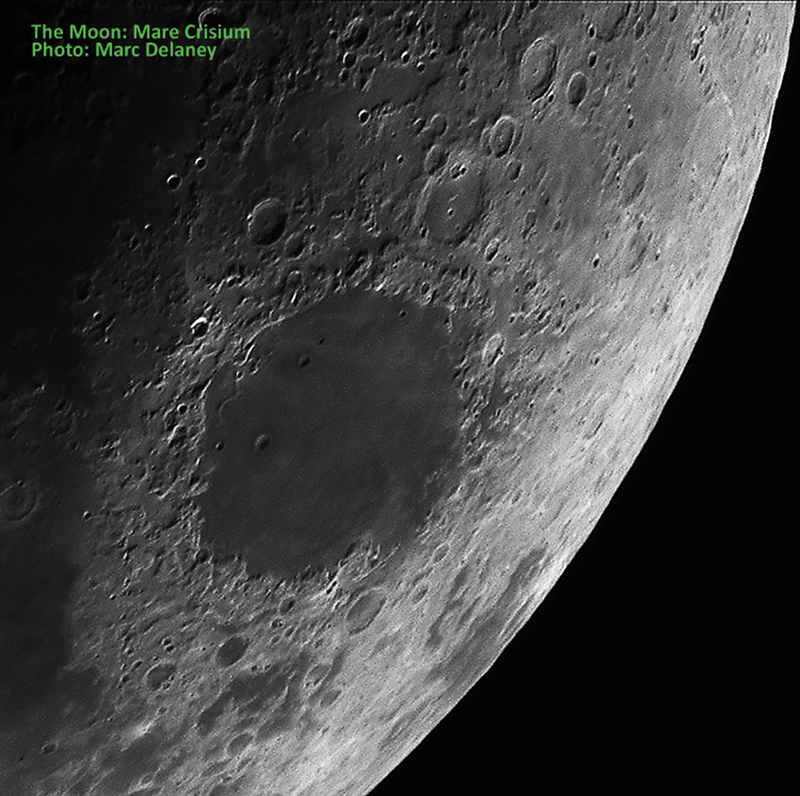 We were extremely lucky to be living and have a clear sky at the time this transit occurred. 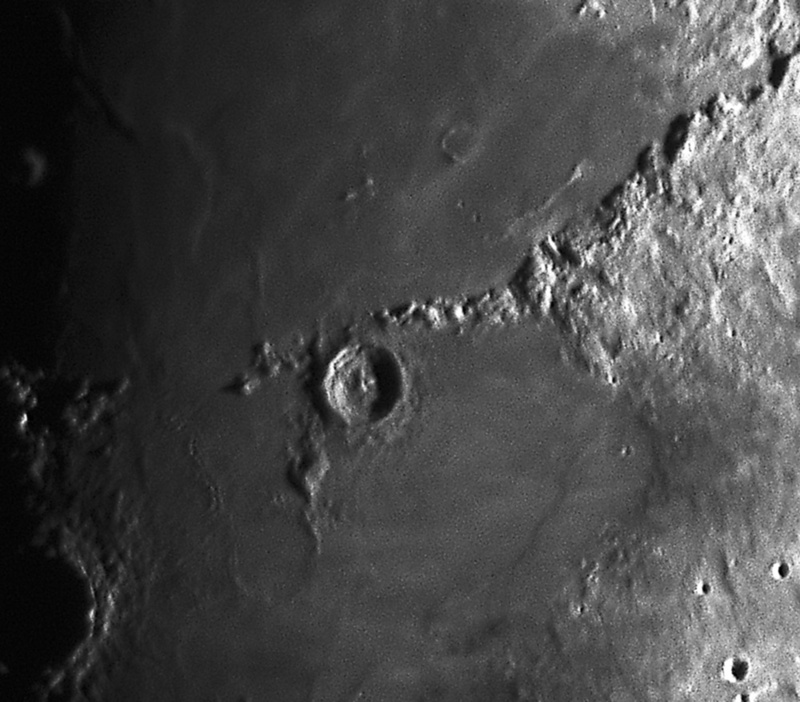 Moon -- Crater Erastothenes and the Mons Wolff mountain range. 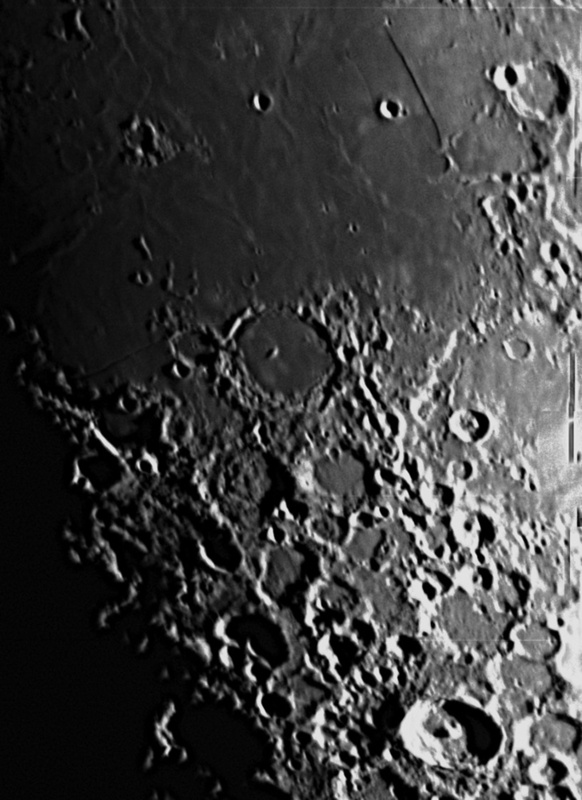 Moon -- Craters Pitatus, Gauricus, Wurzelbauer and Tycho. 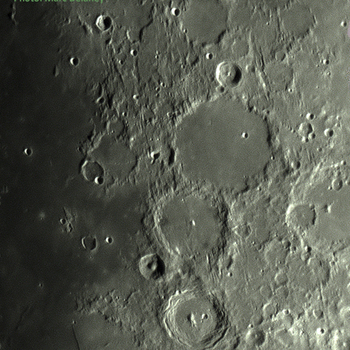 Plus Rima Birt, which is a rile, at top right of image.